How Many Employees Would Your Agency Lose (or Gain) Under Trump's Budget? 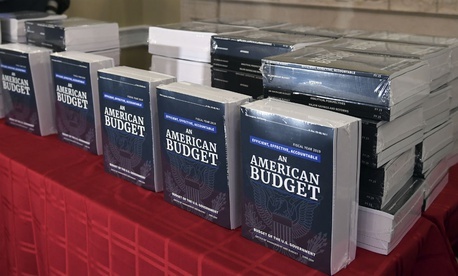 President Trump's fiscal 2019 budget request is light on detail about the reorganization plans agencies were required to submit to the Office of Management and Budget last fall, discussing instead much broader pay and civil service reforms. The proposal does, however, offer some hint as to the magnitude of workforce cuts (or increases) agencies can expect. Estimates of changes in full-time equivalent employees by agency included in the plan range from a 25 percent decrease at the Environmental Protection Agency from 2018 to 2019, to a 21.3 percent increase at the Commerce Department over that time frame. Commerce is preparing for the 2020 decennial census, while EPA has frequently been the target of cuts in the Trump administration. The Homeland Security Department would see the next biggest increase in employees after Commerce, under Trump's request. DHS staffing would go up 7.2 percent, the plan stated. This is in keeping with the priority the administration has placed on hiring more immigration enforcement personnel.